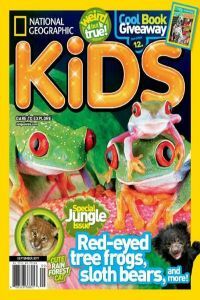 A subscription to National Geographic Kids will help youngsters learn about wildlife, geography, adventure, technology, sports, science and how to protect the planet’s natural resources through easy-to-read stories and outstanding photography. The entertaining magazine is also very educational, focusing on quality content that will inform and inspire young readers. Regular content covers Mammals, Dinosaurs and Prehistoric (explore the past), Birds, Amphibians, Fish, Reptiles, Insects, Invertebrates, U.S. States (facts and photos), Explore the World! (stories about culture, travel and people around the world), National Parks, Homework Help (the tools you need to succeed), Pet Central (pet stories and more), Weird but True (bizarre facts), Wacky Weekend (photos you’ve got to see), Space (all about space discovery and the solar system), 5 Reasons Why (answers to kids’ questions), Awesome (cool pics and facts), Amazing Animals (stories and photos), and Moment Of… (cute or gross, fuzzy or slimy, amazing or strange photos of animals and nature). Issues also often include posters or maps, trading cards, stickers or other special extras!